Today I found out there once was a Major League Baseball player that was traded for himself. That player was Harry Chiti. Chiti was a catcher who played in the major leagues from 1950-1962, taking two years off in that span to fight in the Korean War. The momentous event of getting traded for himself happened in 1962 when Chiti was traded from the Indians to the New York Mets, who were an expansion club that year. Chiti was acquired for a “player to be named later”. After putting up abysmal numbers in 15 games with the Mets, the Mets traded him back to the Indians as the “player to be named later”, officially making him the only MLB player ever to be traded for himself. Upon being returned to the Indians, they immediately assigned him to their AAA club where Chiti spent the next two seasons, eventually retiring from baseball after the 1964 season at the age of 30, having never made it back up to the big leagues. Chiti’s best season by far was in 1959 when he played for the Athletics and in just 55 games posted a 1.4 WAR (wins over replacement level). He also had another good season in 1952 at the age of 19 when he posted .8 WAR in just 32 games, this time with the Cubs who were the team he spent most of his career with. Besides those seasons, Chiti was quite awful most of the time and had a career slash line of .238 BA, .294 OBP, and .365 SLG. For his 11 year career, he managed 2.9 wins over a replacement level player. Lucky for him, even at that time, as it is today, around replacement level catchers tend to manage to find major league teams that will give them playing time off and on for many years, despite the player’s lack of ability. The Mets went on to be plenty crappy without Chiti, winning only 40 games and losing 120 in 1962. Despite this, they drew 922,530 fans, which was the 6th best draw in the league and only about a half a million fans less than the Yankees who were number 1 in attendance that year. The following year, they closed the gap even more (4th best) and only drew about 200,000 fans less than the Yankees. For those not familiar with the baseball stat “WAR”, it is simply a stat that attempts to encapsulate how valuable a player is vs. an arbitrary “replacement level” player. A replacement level player is basically any “AAAA” caliber player. The type that tend to bounce between AAA and the major leagues and can often be found on the bench with major league clubs. These players are typically easy to find and acquire; most teams have no problem finding replacement level players when they need them. As such, this was chosen to be used as the base for WAR. A zero WAR player then is simply a replacement level, typically league-minimum type player. For reference, a major league average position player or starting pitcher tends to be worth around 2 WAR (worth two wins over an equivalent replacement level player). A team with nothing but replacement level players (all 0 WAR) should win between 45-50 games in a 162 game season. WAR is calculated for pitchers by using FIP (Fielding Independent Pitching). For those not familiar with that stat, it’s more or less “ERA” except attempts to get rid of the influence of fielders, whether good or bad. For instance, a pitcher with above average fielders behind them will have a lower ERA than an equivalent pitcher with bad fielders behind them. FIP attempts to get rid of this discrepancy to provide a more accurate view of the pitcher’s performance independent of fielder performance. WAR for position players is calculated by factoring in their wRAA and UZR. wRAA stands for “weighted runs above average” and tells you how many runs a player contributed to their team based on their offensive production. UZR stands for Ultimate Zone Rating and is to date arguably the best way we have to evaluate a player’s defensive contribution to their teams, in terms of how many runs saved for their team. These two numbers are added together to get the total run contribution by a player. These numbers are then weighted depending on what position the player is playing and then weighted so that they are relative to replacement level players. The final total is then represented such that 10 runs = 1 win (this explanation’s already too long, so I’ll leave out explaining how the 10 runs was chosen). So then a player who is 2 WAR (major league average) contributed around 20 runs (whether by defense or offense) over what a replacement level player would have done in their place. The highest career WAR of any player to date is Babe Ruth at 177.7. Although, it should be noted that Ruth’s numbers are likely heavily skewed by the era he played in. For instance, famed player and manager John McGraw once noted that Ruth couldn’t hit “soft stuff” to save his life and McGraw used this to his great advantage when his team faced Ruth and the Yankees in the playoffs, typically shutting him down completely when he had a pitcher who had decent breaking pitches on the mound. If that’s true, Ruth would likely have not been very good as a hitter in the modern era. Sluggers that can “hit a fastball very much” but not hit breaking balls are a dime a dozen and tend to have spectacular AAA careers while floundering in the big leagues. The real question then is would Ruth have been able to adjust to modern pitching if he saw a consistent diet of breaking balls? If so, he probably would have been as good as ever. If not, he might not even have lasted more than a season or two in the bigs. In either case, Ruth was certainly the best player of his era, with nods to Ty Cobb, but it’s not completely fair comparing his numbers to modern era baseball players, for a variety of reasons. The highest WAR totals of position players in the modern era are Barry Bonds (169.8), Willie Mays (163.2), and Hank Aaron (150.5). The highest WAR totals of a pitcher (unfortunately because of lack of statistical data currently only goes back to 1980) goes to Roger Clemens at 145.5 WAR. Clemens is followed by Greg Maddux (120.6), Randy Johnson (114.8), Nolan Ryan (114.8), and Pedro Martinez (92.3). The creation of the New York Mets in 1962 was spurred on by the fact that there was no longer any National League baseball team in New York after the Dodgers and the Giants left a few years earlier to head to California. In homage to who they were replacing, the Mets took the colors of blue (Dodgers) and orange (Giants). The Mets were named after a 19th century baseball club that had existed in New York, the Metropolitans. The Mets played in Shea Stadium from 1964 to 2008 when they switched to their new stadium, Citi Field. Before Shea Stadium, however, they played in the Polo Grounds for two seasons which was in Upper Manhattan and is one of the more famed stadiums in baseball history. The Polo Grounds weren’t actually the original Polo Grounds. There were actually four Polo Grounds, the first in 1876 which was actually used for the sport polo, hence the name. There were three Polo Grounds that came after that original stadium and, despite the fact that none of the subsequent three were ever used for polo, they inherited the name from the original. It was the fourth Polo Grounds that the Mets played in their first two seasons. The original Polo Grounds were used by the New York Metropolitans, the team the Mets were named after, as mentioned earlier. After the Metropolitans, both the New York Yankees and the New York Giants used the Polo Grounds as their home stadium (Yankees from 1912 to 1922; Giants from 1883 to 1957). The New York Giants football team also used the Polo Grounds from 1925 to 1955. Later, the New York Titans Football team used the stadium from 1960 to 1962 followed by the New York Jets in 1963. Even though the fourth Polo Grounds was called the Polo Grounds and is the most famed of the four, nowhere did it actually say “Polo Grounds” anywhere in the stadium until the Mets started using it in 1962. Despite this, it is what people called the stadium from its inception. The official end to the Polo Grounds sports hosting days came in 1963 on December 14th when the New York Jets played the Buffalo Bills. The Met’s mascot “Mr. Met” is thought to be the first MLB mascot ever to be a human (rather than depicted as some animal or the like). He made his first appearance in 1963 on score cards and various promotional items. However, it wasn’t until 1964 that an actual “Mr. Met” appeared in person. Mr. Met also once had a family, including occasional appearances by Mrs. Met and three little Met children. The Mets hold an auspicious record of having their pitchers having gone nearly 8000 games (and counting) without a no-hitter, which is the longest stretch by any franchise in MLB history. You really outdid yourself on this one, Daven. Great post. I appreciate your taking the time to explain the WAR, I’ve been wondering about it forever, and I don’t have time to get a PhD in Sabremetrics. 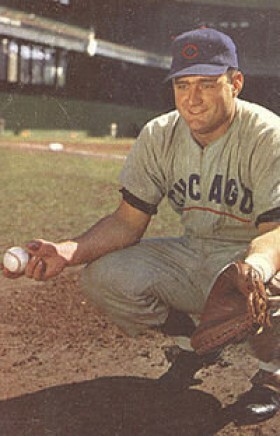 Harry Chiti is one of my absolute favorite facts about baseball. Completely unusual, and the sort of fun story that illustrates the charm and history of baseball. I love it, and i actually linked to it off of my blog for further reading on a blurb i did about him. He was not the only player. Brad Gulden of the Yankees was also traded for himself. (from Wikipedia) Gulden holds a place in Major League Baseball trivia by being only the second player in history to be traded for himself, after Harry Chiti. In 1980, the New York Yankees sent him to the Seattle Mariners with $150,000 for a player to be named and Larry Milbourne, In May 1981, the Mariners sent Gulden back to the Yankees as the player to be named. I met him at a supper club (in 1988) I used to work at in Minn. He was very proud of this fact, but if I recall, he said he was the only player ever traded for himself. I guess he did not know of Chiti at the time. There were 4 players in history that have all fallen to the “trade for a player to be named later” and ended up being themselves. Harry Chiti, Brad Gulden, John McDonald, and the raging alcoholic Dickie Noles. Great post though but we can for sure say that Harry was a C(s)hiti player.